"Psychology helps us to talk about what the novelist knows, but fiction helps us to know what the psychologist is talking about." So writes the author of this brilliant study. The chief impulse of realistic fiction is mimetic; novels of psychological realism call by their very nature for psychological analysis. This study uses psychology to analyze important characters and to explore the consciousness of the author and the work as a whole. What is needed for the interpretation of realistic fiction is a psychological theory congruent with the experience portrayed. 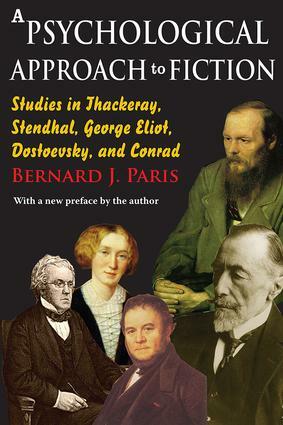 Emerging from Paris' approach are wholly new and illuminating interpretations of Becky Sharp, William Dobbin, Amelia Sedley, Julien Sorel, Madame de Renal, Mathilde de la Mole, Maggie Tulliver, the underground man, Charley Marlow, and Lord Jim. The psychological approach employed by Paris helps the reader not only to grasp the intricacies of mimetic characterization, but also to make sense of thematic inconsistencies which occur in some of the books under consideration. For students of human behavior as well as students of literature, the great figures of realistic fiction provide a rich source of empathic understanding and psychological insight.